Evolve from a fee–for-service, volume-based payment system of care to a value-based payment system that rewards improved health outcomes. Regional solutions for regional environments! While testing a statewide model of healthcare delivery transformation, Idaho is relying on primary care providers to practice patient-centered and effectively coordinated care. This coordination of care is impossible without mobilizing the complete medical/health neighborhood in which patient resides - specialists, hospitals, behavioral health professionals, long term care providers, pharmacists, social service agencies and community based organizations, just to name a few. At the local level, Idaho’s seven Public Health Districts will serve as the main facilitators of the regional effort to address goals and objectives enumerated by the SHIP. They will assist and support primary care practices (PCPs) in the transformation to become patient-centered medical homes (PCMH), convene and support Regional Health Collaboratives and work with the stakeholders to organize and advance greater connection between medical/health neighbors in the region. The Regional Collaboratives (RC) will facilitate development of the medical neighborhoods to strengthen patient care coordination and will convene a regional stakeholder advisory collaborative group. The RC stakeholder advisory collaborative group will have direct input to the IHC through the PHD directors and RC collaborative chairs, so regional and local concerns can be raised at the state level. In the management of RCs, Idaho’s PHDs will lead integration of public health and population management into the model, and will bring an intimate familiarity with local healthcare resources to developing the medical neighborhood. Communities will participate in community needs assessments and will work with the RCs to align specific performance metrics for the PCMHs in their region with identified areas of need. Idaho will test the effective integration of PCMHs into the larger healthcare delivery system by establishing them as the vehicle for delivery of primary care services and the foundation of the state’s healthcare system. The PCMH will focus on preventive care, keeping patients healthy and stabilizing patients with chronic conditions. Grant funding will be used to provide training, technical assistance and coaching to assist practices in this transformation. 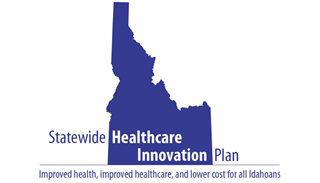 Idaho’s proposal includes significant investment in connecting PCMHs to the Idaho Health Data Exchange (IHDE) and enhancing care coordination through improved sharing of patient information between providers. At the local level, Idaho’s seven public health districts will convene Regional Collaboratives that will support provider practices as they transform to PCMHs. This goal includes training community health workers and integrating telehealth services into rural and frontier practices. The virtual PCMH model is a unique approach to developing PCMHs in rural, medically underserved communities. Grant funds will support development of a state-wide data analytics system to track, analyze and report feedback to providers and regional collaborative(s). At the state level, data analysis will inform policy development and program monitoring for the entire healthcare system transformation. Idaho’s three largest commercial insurers, Blue Cross of Idaho, Regence and PacificSource, along with Medicaid will participate in the model test. Payers have agreed to evolve their payment model from paying for volume of services to paying for improved health outcomes. Financial analysis conducted by outside actuaries indicates that Idaho’s healthcare system costs will be reduced by $89M over three years through new public and private payment methodologies that incentivize providers to focus on appropriateness of services, improved quality of care and outcomes rather than volume of service. Idaho projects a return on investment for all populations of 197% over five years.